Disclosure: The following DVD(s) details and descriptions provided by Amazon.com. Our company may receive a payment if you buy products from them after following a link from this website. Codenamed by the German Army "Operation Barbarossa", this film incorporates unique archival material from both sides in looking at the background and buildup to that assault as well as the battle itself. This is a rare look at one of the worst horror stories in the long infamous history of warfare. This series features captured German and Russian film footage, much of which has never been seen before. For decades the Cold War prevented us from looking closely at what really happened between the Russians and the Germans on the Eastern Front during World War II. More than a struggle between nations, it pitted maniacal tyrant against maniacal tyrant, evil ideology against evil ideology. The lives of tens of millions of human beings were consumed by its raging hatreds and appalling indignities. One in every ten Russians died. One in every four Poles died. Whole divisions of Italians, Romanians, Hungarians disappeared with barely a trace. An average of 17,800 people died on every single day and this, the war on the Russian German Front, lasted for 1,400 days. The series is narrated with chilling precision by actor Douglas Rain. The script, by producer Jerry Lawton, is dark and powerful. The music, by composer Rick Hyslop, captures every nuance of tragedy with discordant clarity. The series features captured German and Russian film footage, much of which has never been seen in the United States. The German invasion of Russia was the biggest, bloodiest and most bitter battle ever fought. It cost the lives of at least twenty million people and ended Europe s dominance of world affairs. It was the head-on clash of the two mightiest armies man has ever known, which no other battle in history can compare with. Although Hitler s opening attack on Russia in 1941 (code named by the German Army Operation Barbarossa ) forms the climax of the narrative, this programme is concerned more with the background and build-up to the assault. Unique archive film from both sides of the Iron Curtain has been incorporated, together with notable contribution from Albert Speer, Hitler s close confidant and Munitions Chief General Warlimont, who planned the campaign and served at Hitler s headquarters throughout the War, General von Manteuffel who helped carry out the scheme and Doctor Paul Schmidt who was Hitler s individual interpreter. The Largest And Fastest Invasion In History Begins The Titanic Struggle Between Germany And Russia During WWII In All Regions DVD Format! 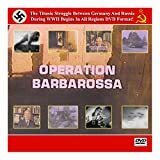 Contents: OPERATION BARBAROSSA (1969, 48 Minutes, Color And B&W) The invasion of Russia by Germany on June 22nd, 1941 is here documented in astonishing film from both sides of the conflict as well as interviews with top German leaders involved in its planning and execution, as well as a clear analysis of the events leading up to and the planning of this greatest of military operatioins up till that time. WHY WE FIGHT: THE BATTLE OF RUSSIA PART 1 (35 Min., B&W) An excellent installment of the "Why We Fight" American propaganda film series that analyzes the events leading up to and the ulitmate failure of the German invasion of Russia. ||||| Like all our titles, this disc is beautifully inkjet printed on the archival quality disc stock, on the front j-card's cover graphics and on the back j-card text description, and is shipped in durable shatterproof jewel case stock. ||||| Thanks for shopping with us, we appreciate it! EarthStation1: The Sights And Sounds Of The Known And Unknown Universe TM, the world wide web's first, most renowned and most awarded historical multimedia archives since its establishment in March 1996, has been approved for teaching history and media studies by many diverse educational institutions and governments worldwide. *Check Out Our Contributions On PBS TV Throughout Ken Burns' Landmark World War II Documentary Series THE WAR As Well As On HISTORY DETECTIVES and The History Channel's WORLD WAR II IN HD - And Check Out Our Contributions To The Current 2013-2014 Season Of UNSEALED ALIEN FILES/UNSEALED CONSPIRACY FILES! * Be sure to check out our other items for sale for more great vintage and historical media titles!